Delightful family executive villa located in a secure gated community, THE SANCTUARY at WEST HAVEN one of the most sought after area beside DISNEY, which is only a two minutes� drive from CHAMPIONS GATE, David LedBetter�s world famous golf course and 10 minutes from the DISNEY attractions. 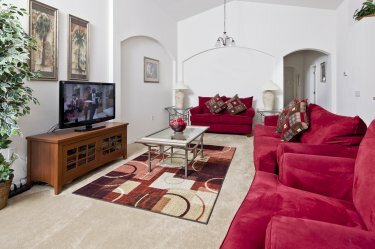 Sanctuary at West Haven is one of the most exclusive gated resort communities in the Orlando area. The resort community is a peaceful country like setting with well -manicured palm tree lined boulevards. Entrance is through coded security gates High quality homes set in beautiful landscaped grounds. At nearby Champions Gate you will find a number of shops, supermarket and restaurants. You have a Publix, Chilli�s, Pizza, and Chinese restaurant also a petrol station and less than 3 miles from five, 18 hole golf courses. The accommodation consists of 4 bedrooms, 3 bathrooms, (2 en-suites)games room and pool. The lounge, well equipped kitchen and dining area are all formed into one large open plan area. The executive villa has a large pool area with lanai which is fully equipped with padded sun loungers, patio furniture and barbecue. The villa is in immaculate condition and tastefully decorated. Villa is looked after by a management company who are only a phone call away if needed to make sure you have an enjoyable stay. Place to relax after a tiring day at the parks. Lounge is a large open plan area with patio doors leading out to pool deck. It has vaulted ceiling with large ceiling fan and decorated in a light colour for a light and airy feel. In lounge we have 2 large luxurious sofas, lounge chair, coffee table and 2 side tables with lamps. Sit and relax after a day at the parks. There is a 40 flat screen cable TV with channels for everyone. DVDS with a DVD player. Selection of board games, books for all the family. In hot weather a fan for keeping cool. Our spacious lounge area is tastefully decorated to a high standard for your home comforts. We also have free Internet access so all you need is your laptop. Dining area seats 6 at the table and breakfast bar seats 3. Kitchen is well equipped with large fridge freezer with ice cube maker in freezer. Dishwasher, electric cooker with large oven, coffee maker, microwave, toaster and waste disposal unit. 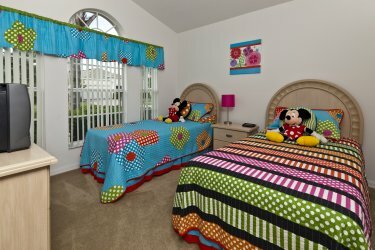 Villa is situated in The Sanctuary, West Haven, Davenport, Florida. In a community with an entrance that is gated. Villa consists of 4 bedrooms, 3 bathrooms, games room and pool. 3 bathrooms consist of 2 en-suites and shared bathroom for twin bedrooms. 30ft pool with safety screen and lighting for night time. Laundry room has washer, dryer, iron and ironing board. All the rooms have TV�S. 24 hour Management Team who are only a phone call away. Fully air conditioned and heating available throughout. 70-80 channels with Cable TV. PlayStation 2 with 2 controllers and games. FREE Use of Baby equipment. FREE phone calls in USA and Canada. Approx.10-15 minutes to Disney Parks. Few minutes� drive from 1- 4 East / West Florida Interstate. Champions Gate Golf course 3 minutes� drive. Deposit of �100.00 per week to secure the booking. Pool heating �12.00 extra per night. Refundable deposit �200.00 to be added on to balance and refunded after 14 days departure from villa when informed no damage, breakages,key returned and safe left open. All taxes included in all the prices.